With Christmas now behind us, the sweetest day of the year is now in sight. Adorned with heart-shaped boxes of yummy chocolates, adorable love-struck lobsters and fortune cookies, these papers are perfect for spreading the joy this Valentine’s Day. Also including a sheet of super-sweet toppers and sentiments, these papers will really help you to show how you feel with your handmade projects! 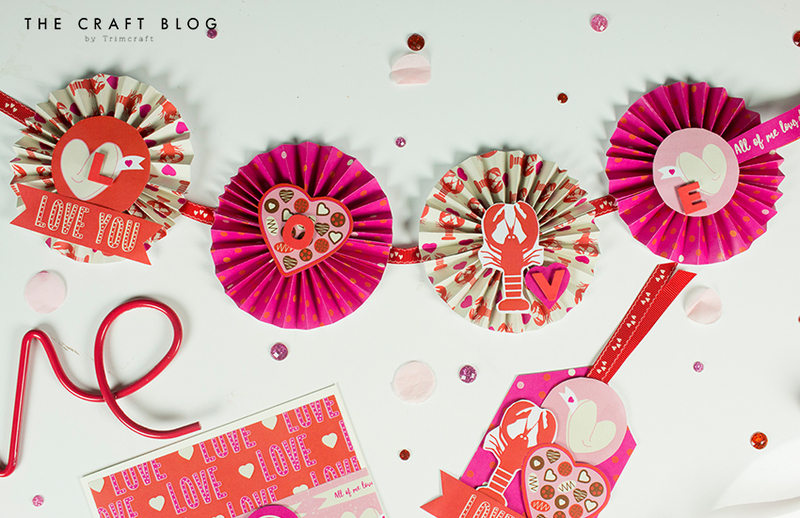 Today, Maxine is going to show you how to use our free paper download to make a beautiful DIY Valentine’s Day banner. This pretty rosette banner will ensure that your home has the look of love for Valentine’s Day, and it’s so easy to create – just follow our step-by-step tutorial below! 1. From one of the free papers, cut two 5cm strips. Score along each piece of paper at 1cm increments. 2. Concertina fold along the strips. 3. Join the two strips together to make one long strip and fold the shape round, adhering to make a circle. 4. From the white cardstock, cut a circle and adhere this to the back of your rosette shape. 5. Cut out a topper from the free papers and adhere this to the front of your rosette shape. Repeat the above steps 3 further times, using a range of different papers and sentiment toppers from our free printable. 6. Use the red cardstock to die cut letters to spell ‘love’ and adhere a letter to the centre of each rosette. 7. Take a length of ribbon and adhere each rosette, using washi or double-sided tape, to create your banner. Perfect for gracing the occasion, you now have your wonderful Valentine’s banner ready to string up in your home! Need the perfect card to go with the thoughtful gift you have picked out for your Valentine? Bright and bold, our free papers have transformed a 6” x 6” card blank into the perfect Valentine’s card, using two of the designs and an eye-catching sentiment topper. Ideal for writing all of your heartfelt messages inside! We also created this colourful gift tag using card stock paired with our free papers, and sentiment toppers adhered with adhesive pads for added dimension. How will you use these fantastic, free Valentine’s Day papers? We would LOVE to see! Make sure to upload your makes to the Inspiration Area and to #trimcraft when uploading to social media! Thanks sooo much for these cute papers here, they´re just adorable, as is especially that little rosette banner, that you made here too. Love these 💖 papers. Thankyou. I just need to win this weeks want it win it competition to complete your lovely rosette banner as I've asked for these alphabet dies in capitals. Id love to make these. Thankyou for the chance of winning #Trimcraft.